Controversial security firm G4S faces a police investigation over its involvement with the US jail at Guantanamo. A leading human rights charity says the firm could be prosecuted if it has profited from human rights abuses at the prison. UK charity Reprieve has lodged a formal complaint with London’s Metropolitan Police against G4S, The Independent revealed on Monday. The human rights organization represents 13 detainees held in Guantanamo Bay and offers legal assistance to many more. Its complaint requires the Met Police to investigate whether G4S has engaged in illegal activity while carrying out work at Guantanamo. The security company won a £70m contract with the US naval base in August 2014. Reprieve alleges G4S could be liable for prosecution under Britain’s Proceeds of Crime Act 2002 if it has generated profits from enabling or carrying out human rights violations at the prison. Potential maltreatment suffered by prisoners relates to abuses such as force-feeding, the charity warns. The charity’s complaint, seen by The Independent, states G4S’ Guantanamo contract replaced a former deal between the US prison and American company Bremcor. Under the Bremcor agreement it was required to carry out “detainee hospital work,” according to Reprieve. The charity argues it is likely that G4S workers, who succeeded those of Bremcor, would have taken on similar duties. As a result, it is “highly plausible” G4S is facilitating and potentially “participating in the force-feeding of detainees,” Reprieve’s complaint states. At the end of December 2014, G4S sold its American subsidiary, G4S Government Solutions, to an anonymous buyer for $135m (£89m). 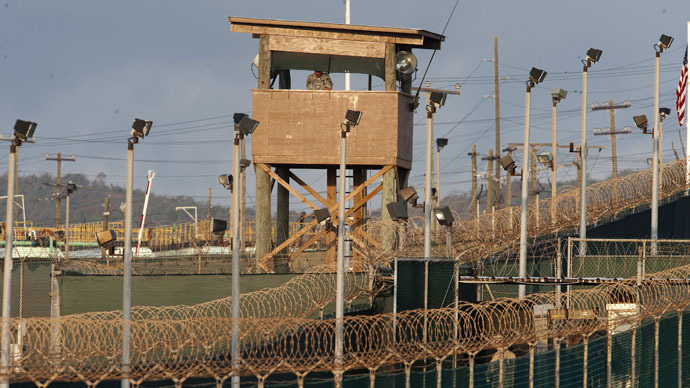 The company supplied cleaning and other janitorial services to Guantanamo. Reprieve suggests this transaction could amount to the selling of unlawful property, which is also a criminal offence under the Proceeds of Crime Act 2002. The human rights charity’s complaint said former G4S subsidiary, G4S Government Solutions, had agreed to funnel one percent of its yearly revenue to its parent company under a royalties agreement. In this sense, UK security company G4S could have profited indirectly from possible legal transgressions carried out at Guantanamo, it warned. UK government ministers have described Guantanamo as a “shocking affront to the principles of democracy.” The US naval base currently holds 127 supposed terrorist suspects who are yet to be charged with any offences. “In addition to being immoral and unethical, G4S’s involvement in Guantanamo Bay may give rise to criminal liability,” Reprieve’s complaint stated. It added for an official investigation into G4S’ relationship with the US prison is in the public interest. Kevin Lo, an investigator at Reprieve, called for UK authorities to hold G4S accountable for its alleged misconduct. “It is a scandal that, while British resident Shaker Aamer still languishes at Guantanamo, G4S has been seeking to profit from the sale of a contract that supports the abuses he and others suffer daily,” he told The Independent. A Scotland Yard spokesperson said the Met has been sent a complaint about G4S, which is being considered by the force. Amnesty International UK backed Reprieve’s call for a full investigation into G4S’ relationship with Guantanamo. “Selling up and walking away from Guantanamo doesn’t mean G4S can wash its hands of any involvement in past abuses,” Allan Hogarth, Amnesty’s UK head of policy and government affairs, told The Independent. Since 2002, almost 780 Muslim men and boys have been detained at Guantanamo, at least 15 of which were children. The majority of these prisoners were handed over to American authorities when the US military offered hefty bounties for the capture of terror suspects. Only eight men detained at the US naval base have been convicted by Guantanamo’s military commission, and just one man has faced prosecution in an American federal court. To date, no organization or individual has been held accountable for the unlawful detention and alleged abuse of prisoners held at Guantanamo Bay.